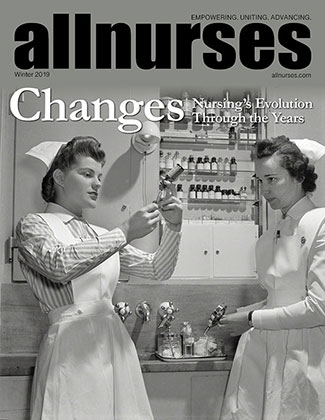 allnurses Gives Back to Educators! Free Membership! Wonderful gift. Thank you so much! I did post a link on the Nurse Educators Group on Facebook. About productive hours per patient day? Sorry for the delay in response. If you are interested in defining your variance to hours assigned, simply multiply the hours you ran for the 24 hour period by your total census. If you ran 6.28 hours and your census was 24 patients, this means you ran a total of 150.72 hours for the day. if you were budgeted to run 6.00 hours, that means you were over budget by 6.72 hours. 6.28 X 24 = 150.72 6.00 X 24 = 144.00 Variance to budget: 6.72 hours. Hope this helps. Great! I am glad to see that this thread is still helpful to nurse managers even today! As far as assessment is concerned, I have always gone with the premise that your policy should speak to how your hospital or unit assesses patients. For example, we know that the patient in an acute care environment must be assessed by a registered nurse every 24 hours. Defining a specific timeframe for this assessment is something I would avoid. If you are unable to meet your policy expectation for some reason, then you are out of compliance. Better to simply say that the patient is assessed every 24 hours by an RN. Hope this helps! I really just discovered this thread and am so sad to read some of these stories. New nurses need to be embraced by our profession and given really and true opportunities to transition to practice so they can realize the difference they make in the lives of patients they care for each day. We need each and everyone of you in the profession today and I am thankful that you have made the choice to become nurses. I have been a nurse now for almost 26 years and I am not even old yet ... :) But I have seen the ups and downs of the profession and can tell you that being a nurse is the single best decision I have ever made in my life. Your transition can be hard! Fight for the orientation and training time that you need. Remember ... as a new RN your practice is your practice and you need to define your time frame for transition. While I recognize the pressure many new graduates get from employers to "get productive." At the end of the day ... you are the professional and you need to define what you need in order to be effective for your patients. Remember however, there is a lot of learning. Ask many questions - find another RN you feel comfortable with and utilize him or her to guide you. Stay in contact with your nursing instructors, fellow graduates and continue to build a network of nurses around you. Keep your textbooks close at hand and continue to study and learn. Your first year will pass and before you know it, you will be talking the talk and walking the walk. Just remember .... when you finally do transition and you are the experienced nurse - remember that new graduate and provide them with the support, compassion and networking that you needed when you started. For those of you that are interested .... many organizations have heard your voice and are calling for a much better development period for new graduate nurses .... this also includes LVN/LPNs. The National Council for State Boards of Nursing are working to conduct a study of new nurses transitioning into practice. This study will provide some wonderful evidence as a means to support your concerns. Also, the IOM has called for nurse residency programs that offer new graduates with a reasonable time frame to get use to their new responsibilities. They are hearing you. NCSBN Link: https://www.ncsbn.org/363.htm Best wishes to each and everyone of you. Come back and post frequently - tell us how you are doing. RossayRN - cut yourself some slack here. If you consider the amount of learning that takes place during your first year of nursing, let alone during your entire career as an RN, then you will see you are doing just fine. I know this post was in November and I have not yet finished reading the thread, but I hope things are going a little better for you now. Hi All - great to see where this discussion thread has gone over the past year. I did enroll with Capella in the DNP program (launched in October of 2010). The program is strong and has a great time investment, but worth it. I am moving on to my second quarter in a 10 quarter program. If you want to know anything - give me a shout. Where should a nursing instructor begin? First of all bravo on wanting to be a nurse educator. We need as many as we can get. For me, when I first began my educational journey to teach - there were little resources and very few people really knew what direction I should take. Thanks to several folks on allnurses.com, I received some great information. Like you - I started out as an LPN with a strong desire to teach. Today - I am in my PhD program and have been teaching in an ADN program for several years. It has been a wonderful road and I have never had any regrets. To start off with - you really need to finish your RN and get some practical experience in acute care. You can accomplish this by working in acute care while you are earning your bachelors and masters degree. Once you have a BSN - you can generally teach as a clinical adjunct instructor in the hospitals through the college. This will get your foot in the door and also give you some wonderful experience dealing with students. Of course - after you finish your masters degree - you can teach full time at the ADN level without too much trouble. Teaching at the university may also be an option, but more and more university programs are requiring a terminal degree to teach in their nursing programs - including BSN level. While this may not be true every where - your options may be somehwhat limited until you have a terminal degree. I hope this helps and best wishes as you move forward with your nursing education. Hi Shari, First - congratulations on your progress in the program. The 7 classes will go pretty quickly. I remember when I was at that stage and thinking I would never get this done. But the time does pass and all of the sudden you are completing your last class and wondering where the time went! One of the things I did to prepare for my portfolio was to make sure that I saved every single document I had ever created in the program. I kept my files on my computer hard drive under a separate folder and also kept another copy of files on a thumb drive. This helped me a great deal. When I did my portfolio - I had all the documents they wanted on the first go round without having to find things. Some of the students in my class could not find papers they completed at the start of the program. They had to call tech support, have them locate the paper from 1 or 2 years ago - it was really crazy. I had them all because I saved everything! In terms of the practicum - start thinking about who you would like to do your practicum with and ask them early. The person you do your practicum with needs to be a MSN prepared nurse. You need to identify a project that you want to do for your practicum. For me - I was in the education track so I selected an educator that I respected and we developed a online Nutrition course that was for credit. I helped to co-facilitate this course for my practicum. It was great because I could do most of my hours from the computer as I graded papers and added to the student's discussions posts for each week. It feels stressful as you are approaching this portfolio and practicum courses - but Walden really does a wonderful job of making sure you have what you need to get everything done. My course instructor was the same for my last two classes and she was AWESOME! Best wishes for your success. Hi Catherine - thanks for your post. Tell me what sold you on the program? I looks like a wonderful program and after speaking with some of the folks at Capella - it sounded like a good match for me. But I learned that they don't really employ many of their graduates and this concerned me. I know that many other colleges employ their graduates - so perhaps this is not really an issue. I do like their program though and it seems very doable.